A selection of species and voucher specimens of particular interest are featured here. The voucher photograph shows the characteristic reddish staining. The New Bride Blusher is Amanita novinupta. This western species is a member of the Amanita rubescens group. The original type specimen is from Oregon, 1992. Drs. Tulloss and Yang are actively unravelling the systematics of this genus. 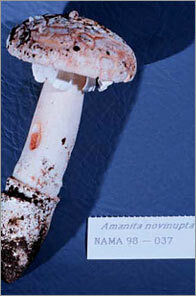 Find out more by visiting their Amanitaceae website and their page on Amanita novinupta. This species occurs with oaks from the Pacific Northwest of the USA to southeastern Arizona. On dead branch in bottomland forest. This voucher is located with S.M. Huhndorf's ascomycete collections at F. as S.M. Huhndorf 4131. The micrograph images by Andrew Miller show characteristic obpyriform (pear shaped) fruitbodies with setae (hairs). This species has gelatinous fruitbody walls. Fig. Cercophora scortea 1. Fruitbodies (x25) with inset of single fruitbody (x50). 2. 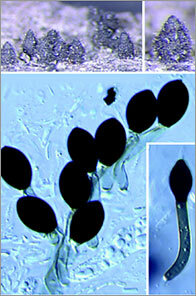 Mature brown-headed ascospores with inset of single ascospore showing dark brown head and pale brown tail. On soil under Lodgepole Pine. 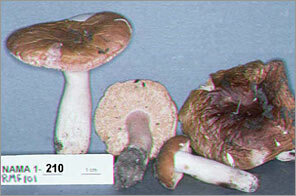 The first NAMA foray that operated a voucher program resulted in a new species that was published: Ray M. Fatto, 1999, Three new species of Russula. Mycotaxon. 70:167-176 . See record of this taxon on Index Fungorum or MycoBank. The New York Botanical Garden has the isotype and other collections. Ray Fatto contributed a great deal to the understanding of the American russulas.